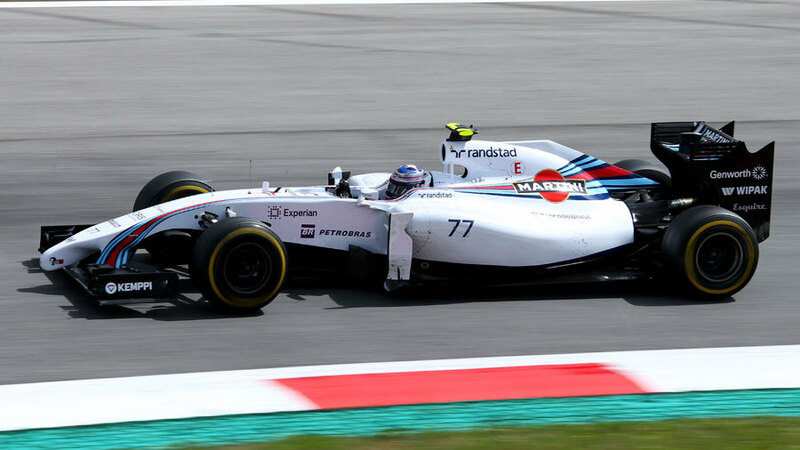 Williams' Valtteri Bottas set the fastest time in final practice ahead of qualifying at the Austrian Grand Prix, beating Lewis Hamilton by just 0.050s. Although Bottas' time was still 0.3s shy of Hamilton's best effort in Friday practice, he got the better of the Mercedes driver in the closing stages of the hour-long session as the Williams set the first and third fastest times. Felipe Massa was also in among the top three with a time 0.053s off his team-mate, while Toro Rosso's Daniil Kvyat also managed to clock a time within a tenth of the lead Williams. Mercedes has had a tendency not to show its hand in FP3 this year and Rosberg, who clearly had plenty of work to do with 31 laps completed, finished fifth fastest and 0.151s off the pace. The short lap meant the top 12 were separated by less than a second, meaning a single mistake is likely to be the difference between a Q3 spot and a grid position outside the top ten in qualifying. Fernando Alonso ran wide at Turn 2 on his first attempt on super-softs, but recovered to come within 0.206s of Bottas' best on his next lap. His fastest lap may also have been hampered by the dust thrown up when Sergio Perez ran wide in front of him at the final corner. Perez made the same mistake again towards the end of the session, but the second time he was launched into the air as he crossed tarmac pathways on the grass. His car took a big hit but had no obvious damage as he carried back round to the pits. Daniel Ricciardo was the highest-placed Red Bull in seventh, as the home team again struggled to get the most from its car. Sebastian Vettel was tenth fastest in the other RB10, with Kevin Magnussen's McLaren and Kimi Raikkonen's Ferrari splitting the two Red Bulls. The second McLaren of Jenson Button finished the session at the bottom of the time sheets after a rear brake issue brought an end to his session after just four laps. The damage to the right rear corner of the car kept him in the garage for the rest of the session.